This article is about the flower. For the children's picture book by Kevin Henkes, see Chrysanthemum (book). For the short story by John Steinbeck, see The Chrysanthemums. 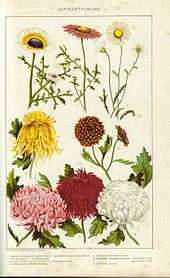 Wild Chrysanthemum taxa are herbaceous perennial plants or subshrubs. They have alternately arranged leaves divided into leaflets with toothed or occasionally smooth edges. The compound inflorescence is an array of several flower heads, or sometimes a solitary head. The head has a base covered in layers of phyllaries. The simple row of ray florets are white, yellow or red; many horticultural specimens have been bred to bear many rows of ray florets in a great variety of colors. The disc florets of wild taxa are yellow. The fruit is a ribbed achene. Chrysanthemums, also known as ‘mums’, are one of the prettiest varieties of perennials that start blooming early in the fall. This is also known as favorite flower for the month of November. Chrysanthemums were first cultivated in China as a flowering herb as far back as the 15th century BC. Over 500 cultivars had been recorded by the year 1630. The plant is renowned as one of the Four Gentlemen in Chinese and East Asian art. The plant is particularly significant during the Double Ninth Festival. The flower may have been brought to Japan in the eighth century AD, and the Emperor adopted the flower as his official seal. The "Festival of Happiness" in Japan celebrates the flower. Yellow or white chrysanthemum flowers of the species C. morifolium are boiled to make a sweet drink in some parts of Asia. The resulting beverage is known simply as chrysanthemum tea (菊 花 茶, pinyin: júhuā chá, in Chinese). In Korea, a rice wine flavored with chrysanthemum flowers is called gukhwaju (국화주). Chrysanthemum leaves are steamed or boiled and used as greens, especially in Chinese cuisine. The flowers may be added to thick snakemeat soup (蛇羹) to enhance the aroma. Small chrysanthemums are used in Japan as a sashimi garnish. Pyrethrum (Chrysanthemum [or Tanacetum] cinerariaefolium) is economically important as a natural source of insecticide. The flowers are pulverized, and the active components, called pyrethrins, which occur in the achenes, are extracted and sold in the form of an oleoresin. This is applied as a suspension in water or oil, or as a powder. Pyrethrins attack the nervous systems of all insects, and inhibit female mosquitoes from biting. In sublethal doses they have an insect repellent effect. They are harmful to fish, but are far less toxic to mammals and birds than many synthetic insecticides. They are not persistent, being biodegradable, and also decompose easily on exposure to light. Pyrethroids such as permethrin are synthetic insecticides based on natural pyrethrum. In some countries of Europe (e.g., France, Belgium, Italy, Spain, Poland, Hungary, Croatia), incurve chrysanthemums are symbolic of death and are used only for funerals or on graves, while other types carry no such symbolism; similarly, in China, Japan and Korea, white chrysanthemums are symbolic of lamentation and/or grief. In some other countries, they represent honesty. In the United States, the flower is usually regarded as positive and cheerful, with New Orleans as a notable exception. In the Victorian language of flowers, the Chrysanthemum had several meanings. The Chinese Chrysanthemum meant cheerfulness, whereas the red Chrysanthemum stood for I Love, while the yellow Chrysanthemum symbolized slighted love. In Australia,the chrysanthemum is sometimes given to mothers for Mother's Day, which falls in May in the southern hemisphere's autumn, which is when the flower is naturally in season. Men may sometimes also wear it in their lapels to honour mothers. Chrysanthemums were first cultivated in China as a flowering herb as far back as the 15th century BC. The plant is particularly significant during the Double Ninth Festival. Industrial musicians Einstürzende Neubauten base their song "Blume" around the flower. 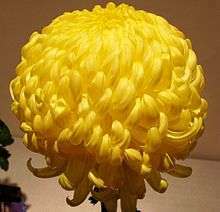 de:Sven van Thom also based a song on the flower, in which he uses parts of a scientific description of Chrysanthemum as lyrics. In Italy chrysanthemums traditionally represent death and are often placed on a person's tombstone as an offer, especially on All Souls' Day. Because of this, giving someone a bunch of chrysanthemums is a taboo and may be regarded as a sign of disrespect (associated with a sort of "death wish"). Chrysanthemum shows have been traditionally held in many towns. The Imperial Seal of Japan, used by members of the Japanese Imperial family. 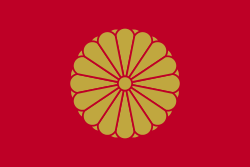 In 1869, a two-layered, sixteen petal design was designated as the symbol of the Emperor. Princes used a simpler single-layer pattern. A number of formerly state-endowed shrines (官国弊社, kankokuheisha) have adopted a chrysanthemum crest; most notable of these is Tokyo's Yasukuni Shrine. The city of Nihonmatsu, Japan hosts the "Nihonmatsu Chrysanthemum Dolls Exhibition" every autumn in historical ruin of Nihonmatsu Castle. The chrysanthemum is also considered to be the seasonal flower of September. The founding of the chrysanthemum industry dates back to 1884, when Enomoto Brothers of Redwood City, CA (San Mateo County) grew the first chrysanthemums to be grown in America. In 1913, Sadakasu Enomoto (of San Mateo County) astounded the flower world by successfully shipping a carload of Turner Chrysanthemums to New Orleans for the famed All Saints Day Celebration. The yellow chrysanthemum is the official flower of the fraternity Phi Kappa Sigma, the sorority Sigma Alpha and the pharmacy fraternity Lambda Kappa Sigma. 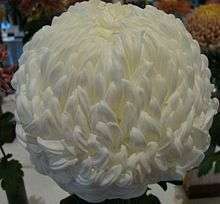 The white chrysanthemum is the official flower of Triangle Fraternity. The chrysanthemum is the official flower of Phi Mu Alpha Sinfonia. The purported color is white, per Sinfonia headquarters (likely variety is the incurved football mum species). The term "chrysanthemum" is also used to refer to a certain type of fireworks shells that produce a pattern of trailing sparks similar to a chrysanthemum flower. Tutankhamen was buried with floral collars of chrysanthemum. Resins of the plant were used in incense cones used to ward off insects. In the Three Stooges short "Pop Goes the Easel"(1935), the spelling of 'chrysanthemum' is used as the foundation of a gag sequence, highlighted by Curly Howard rattling off a quick, correct spelling in a matter-of-fact tone, as though surprised that anyone would not know that. ↑ Liu, P. L., et al. (2012). Phylogeny of the genus Chrysanthemum L.: Evidence from single-copy nuclear gene and chloroplast DNA sequences. PloS One 7(11), e48970. ↑ David Beaulieu. "Chrysanthemums and Hardy Mums – Colorful Fall Flowers". About.com Home. ↑ Chisholm, Hugh, ed. (1911). "Chrysanthemum". Encyclopædia Britannica (11th ed.). Cambridge University Press. 1 2 Chrysanthemum. Flora of China. eFloras. ↑ Flowers Chrysanthemum Archived 6 March 2016 at the Wayback Machine. ↑ B. C. Wolverton; Rebecca C. McDonald; E. A. Watkins, Jr. "Foliage Plants for Removing Indoor Air Pollutants from Energy-efficient Homes" (PDF). Retrieved 27 Dec 2013. ↑ Flower Meaning. Retrieved 22 September 2007. Archived 12 October 2007 at the Wayback Machine. 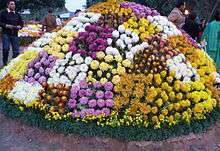 ↑ "Chrysanthemum (Mums) Flower Meaning & Symbolism - Teleflora". ↑ "Flowering Plants and Shrubs". ↑ "Remarkable Investment Attraction Result of Tongxiang City". Zhejiang Foreign Frade and Economic Cooperation Bureau. Archived from the original on 16 December 2003. Retrieved 17 July 2009. ↑ 2010年03月27日星期六 二月十二庚寅(虎)年. "国学365-中国历代菊花诗365首". Guoxue.com. Retrieved 27 March 2010. ↑ Jones, Colin. "Badges of honor: what Japan's legal lapel pins really mean". Japan Times. Retrieved 26 February 2015. ↑ Inoue, Nobutaka (2 June 2005). "Shinmon". Encyclopedia of Shinto. Retrieved 17 November 2008. ↑ "Markings on Japanese Arisaka Rifles and Bayonets of World War II". ↑ "二本松の菊人形". City.nihonmatsu.lg.jp. Retrieved 27 March 2010. ↑ Chrysanthemum: The Official Flower of Chicago. Chicago Public Library. ↑ City of Salinas Permit Center. City of Salinas Community Development Department. ↑ "Sigma Alpha, University of California, Davis chapter". ↑ "Birth Month Flower of November – The Chrysanthemum – Flowers, Low Prices, Same Day Delivery". 1st in Flowers!. 27 October 2008. Retrieved 27 March 2010.